SCOTTSDALE, Ariz., March 02, 2016 – Global Mobility Solutions (http://gmsmobility.com/) recently hosted its annual partner forum, an event recognizing members of its Premier Alliance Network – an elite partnership of transportation and relocation service providers. This year’s forum was branded as #TrendUp; the forum focused on emerging trends within the relocation management industry. The highlight of this year’s forum was the much-anticipated client panel. Suppliers held a lively Q and A session with human resources management from Fortune 500 companies, as well as one of the largest nonprofit health care providers in the world. 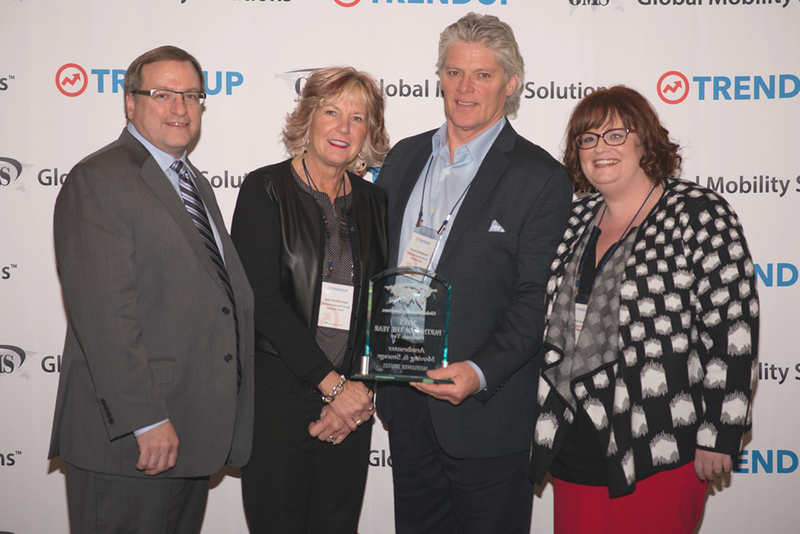 GMS President Steven Wester (left) and GMS Transportation Director Ann Knapp (right) Award Armbruster Moving and Storage (center) with Platinum Partner of the Year Award at 2016 Forum | #TrendUp. In addition to the client panel and Partner of the Year awards, a trio of workshop sessions provided an opportunity for participants to gain insight into some fast-emerging trends in the relocation industry, led by experienced subject matter experts. Chuck Matthews, Chief Executive Officer of WGM Holdings and a member of the FBI’s InfraGard partnership, headed a session on cyber security for small to mid-sized businesses. According to cyber security firm Symantec, 60% of cyber attacks target SMBs, resulting in billions in losses annually. Matthews offered background on the origin of these attacks and their continuously evolving levels of sophistication. The session focused primarily on what managers and owners can do to protect their valuable assets, not to mention their reputations, against digital fraud and hacking. Other sessions included “Standards Please,” in which GMS Vice President of Domestic Services Nancy Kritzer illustrated the importance of consistent standards in communication. Meanwhile, performance analytics as a critical tool for the modern enterprise was the theme of “Measuring What Matters” with GMS Vice President of Global Services John Fernandez. Every year, the partner forum allows GMS and its Premier Alliance Network an opportunity to demonstrate their shared commitment to philanthropy. For GMS, that commitment has included significant efforts to end childhood hunger in local communities. This year’s forum featured both an online pre-forum raffle and an in-forum raffle that resulted in a donation of over 50,000 meals to St. Mary’s Food Bank in Phoenix to help eliminate hunger. Founded in 1987, Global Mobility Solutions is a global corporate relocation services company that specializes in workforce mobility. The company’s corporate relocation services include global assignment management, domestic relocation management and a range of pre-decision solutions. Global Mobility Solutions is a back-to-back winner of HRO Today’s 2014 and 2015 client satisfaction survey, and rated number 1 in the relocation management industry for breadth of services.